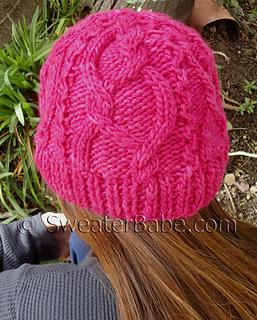 Malabrigo softness wraps your head in casual, stylish warmth with this richly cabled hat. 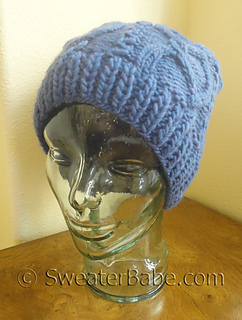 The blue sample shown at right is deliberately slouchy for a relaxed fit. 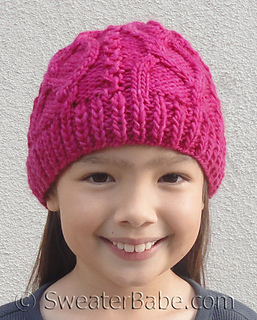 The pink, less slouchy, traditional-fitting hat is shown on the left. 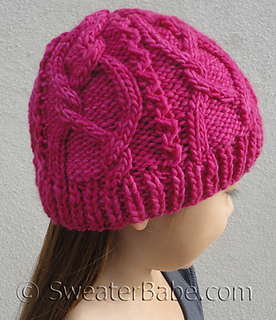 Both feature beautiful meandering cables that become narrower as they go up the hat, culminating is a pretty 5-petal flower design (see photo on next page). 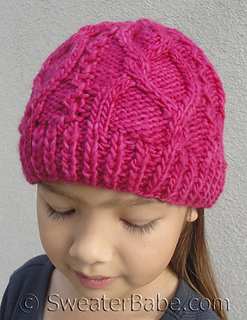 A thick brioche ribbing stitch pattern is used for the band for a nice finished look that also keeps your ears cozy. 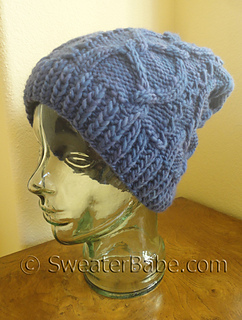 This is a quick and versatile unisex pattern that looks fabulous in any of the Malabrigo hand-dyed shades AND it uses less than one ball for a hat!